BMW has a rich history of roadsters that have stood out as icons of pure driving pleasure. In 2019, now another is about to join the hall of fame in the shape of the new Z4 – a premium open-top sports car boasting a classic fabric soft-top, an emotion-packed body design and a puristic, driver-focused interior. The new two-seater has been systematically designed for maximum agility, thrilling dynamism, plus supremely precise steering characteristics with instantaneous response. The new Z4 combines its sporty on-road prowess with a wealth of highly advanced, top-class equipment features on the driver assistance, operation and connectivity fronts. The car’s proportions provide the most striking evidence of how the classic roadster concept has been reinterpreted. Compared to its predecessor, the new Z4 has grown in length by 85mm to 4.3m, is 74mm wider (now 1.8m) and 13mm taller (1.3m). The shortening of the wheelbase by 26mm to 2.4mm serves to sharpen agility, as do the notably wider tracks – 1.6m at the front (+ 98mm) and 1.6m at the rear (+ 57mm). Market launch sees a choice of two model variants, including a BMW M Performance option. The new BMW Z4 M40i (fuel consumption combined: 7.4 – 7.1 litres/100km; CO2 emissions combined: 168 – 162 g/km) is powered by a six-cylinder in-line engine delivering 250kW. The BMW Z4 sDrive20i (fuel consumption combined: 6.1 – 6.0 litres/100 km]; CO2 emissions combined: 139 – 137 g/km), meanwhile, takes to the stage with a four-cylinder unit producing an output of 145 kW respectively. With its new-look mesh-design BMW kidney grille and – for the first time – a vertical headlight arrangement, the car cuts an unmistakable figure from the front. The new BMW Z4 is equipped with LED headlights as standard, while the optional Adaptive LED headlights add a matrix function for the non-dazzling high beam and cornering lights. The elongated bonnet with arrow-shaped contour lines directed at the kidney grille straddles the wheel arches in the “clamshell” style so characteristic of classical sports cars. The joins at the bonnet’s sides merge into the upper character line that runs back along the flanks all the way to the tail lights. A second character line emerges from the large Air Breather rearwards of the front wheel arch. This interplay of surfaces mimics the flow of air sweeping along the new Z4, while the boot lid’s integral spoiler, slender L-shaped light units and diffuser set the tone for the car’s muscular rear end. There is a choice of five exterior paint shades and the fabric soft-top comes in Black as standard or Anthracite with silver effect as an option. It is electrically operated and can be opened or closed in ten seconds, even when travelling at up to 50km/h. The BMW Z4 M40i is upholstered in leather and Alcantara interior. A storage space behind the seats, cupholders under the centre armrest cover (which folds open in two sections with a longitudinal split) and large door pockets add further practical features. Boot capacity is 281 litres whether the soft-top is open or closed – an increase of more than 50% compared to the outgoing model. Its engines send power to the road through the latest-generation eight-speed Steptronic Sport transmission. Hard at work in the BMW Z4 M40i is a 3.0-litre straight-six unit featuring M Performance TwinPower Turbo technology. The 250kW engine generates peak torque of 500Nm and propels the roadster from 0 to 100km/h in 4.6 seconds. The line-up of engines is completed by the 2.0-litre four-cylinder unit. In the new BMW Z4 sDrive20i, maximum output of 145kW and peak torque of 320Nm translate into a 0 to 100 km/h time of 6.6 seconds. 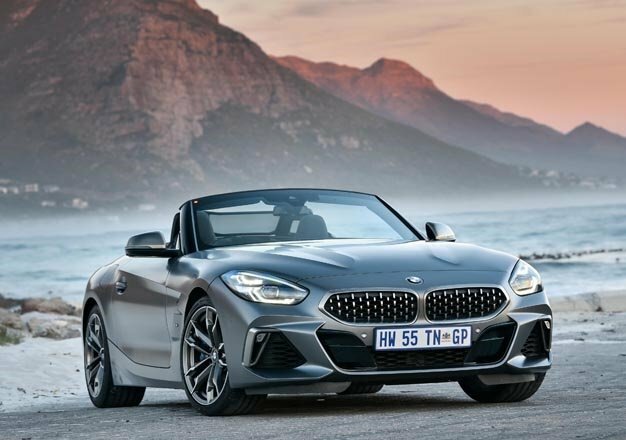 The chassis technology in the new BMW Z4 has been designed across the board for supreme agility and handling dynamics, and comprises a newly designed double-joint spring strut axle at the front and a five-link rear axle that is making its debut in a BMW roadster. This particular combination strikes just the right balance between sportiness and ride comfort. Another feature on the standard equipment list is variable sport steering with adjustment of both power assistance and steering angle to suit the situation at hand. The Adaptive M Sport suspension, M Sport brakes and electronically controlled M Sport differential (all part of standard specification for the new BMW Z4 M40i, together with high-performance tyres) elevate the car’s sporty handling abilities to even greater heights. With these chassis systems on board, selecting COMFORT, SPORT or SPORT+ mode with the Driving Experience Control switch changes the car’s responses particularly clearly. The standard 18" (BMW Z4 sDrive20i) and 19" (BMW Z4 M40i) light-alloy wheels, plus more optional 19" items, are all shod with mixed-size tyres.